USS LST 393, Muskegon, Mich.
Immerse the group in the excitement of the 1900s lumber boom by visiting two Queen Anne homes of lumber barons Charles Hackley and Thomas Hume. The Hackley and Hume homes wrap groups in a unique living space, bringing late 19th-century craftsmanship to life. In the Hackley House, visitors experience an exquisite example of Victorian architecture and late 19th-century interior decorative arts. Take a nostalgic stroll through the Muskegon Heritage Museum, where groups can see a working steam engine, an antique Brunswick pinsetter and more than 12,000 square feet of exhibits. Find out how springs are made and watch vintage machinery in operation. Visitors are surprised to see how many familiar products were made in Muskegon. Go on a maritime and lighthouse tour, where the group will travel by land and lake to see lighthouses and World War II vessels, and enjoy a sunset dinner on the water. 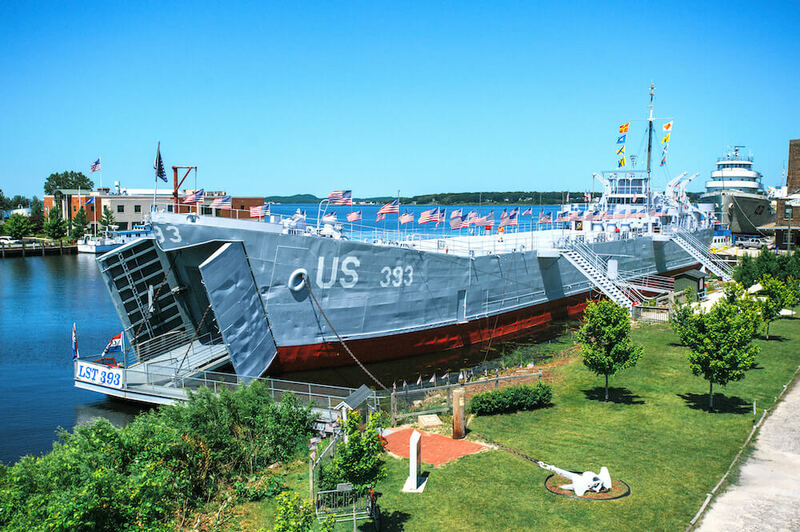 This tour features a stop at the USS Silversides Submarine Museum, a restored WWII submarine where groups experience what it was really like to sail a submarine trolling the waters of the South Pacific over 60 years ago. Also on this tour is a stop at the USS LST 393 Veterans Museum. Here, history jumps out from every deck and corner. This veteran of Omaha Beach earned three battle stars in World War II. With only two Landing Ship Tanks left in the United States, take the unique opportunity to dine aboard the LST 393, where heroes once walked. Whatever a group’s interest is, Muskegon can provide tour operators and travel leaders with compatible attraction options, a variety of lodging options with trusted names, great dining and custom itinerary planning. Explore Muskegon and see why it’s the perfect match for the next motorcoach tour.